We like to bring you news of research discoveries as and when they happen; this discovery was made in our search room about two hours ago, by Matthew Pawelski. OK, actually, it’s not a discovery per se, having been published in various forms before (e.g. Lynn Willies’ article in the Bulletin of the Peak District Mines Historical Society). But let us not get bogged down in semantics. 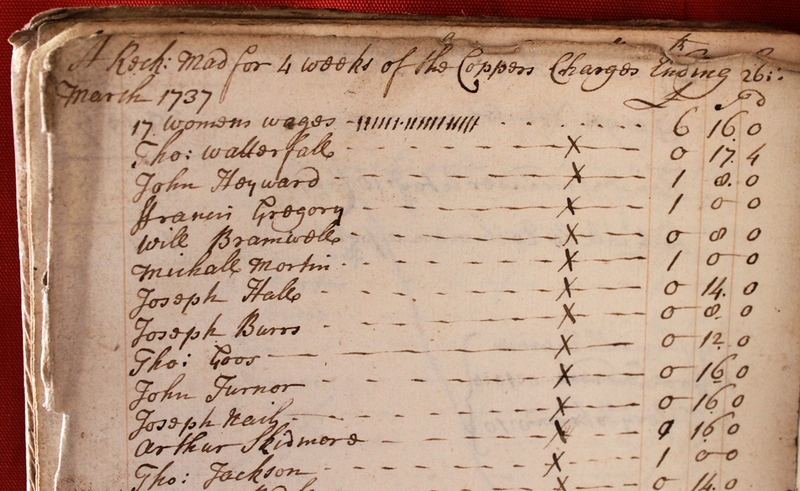 Instead, have a look at this extract from a 1737 reckoning book for the Miners Engine lead mine at Eyam Edge. The section shown is principally dedicated to recording payments made to individual “coppers”. Nothing to do with the police, and it’s usually spelled “copers”; it refers to the men who were extracting lead ore below ground. Above their names, you will spot a reference to “17 women’s wages”, coming to £6 16s. Assuming this was shared equally, that comes to 8s each, or 40p in new money). A number of people have indicated that they were be able to attend the talk on Wednesday 9th July but have expressed an interest in obtaining notes about it. I am hoping that I will be able to put an edited version of the talk on our website, possibly with images of some of the manorial records I have chosen. This is likely to be a much less rambling and more coherent account than the actual talk given, so people who weren’t able to make it will probably have the better of the bargain. I will be writing it up properly over the next few weeks, and once it gets past the censors, it will hopefully appear some time next month. Watch this space, as they say. What do you think of our catalogue? It’s been 18 weeks since we installed the new version of our catalogue. That isn’t traditionally regarded as a significant anniversary, I know, but it’s probably long enough to allow for reflection on progress to date. We would love to hear your opinions. Is the new catalogue better than its predecessor? What do you like about it, and what would you like to see changed? Have you tried looking at some of the images that have been added to the catalogue? Do you like being able to read the lists that aren’t yet in the database? What would you change if it was up to you? I can’t promise to be able to make all the changes that are asked for, but I will reply to any comment that needs a response. There is every chance you will suggest something that is already in the pipeline – with a bit of time (that most precious commodity!) there are a lot of improvements to be made. On 10th July 2014, Matlock was greeted with an old face which was a surprise to many as she hasn’t visited for around 2o years. So who could this old face be? Well only the Queen herself. Her Majesty arrived in Matlock on Thursday 10th July by train and is visiting Lea Mills and Chatsworth which reminds us very much of her visit back in 1968. 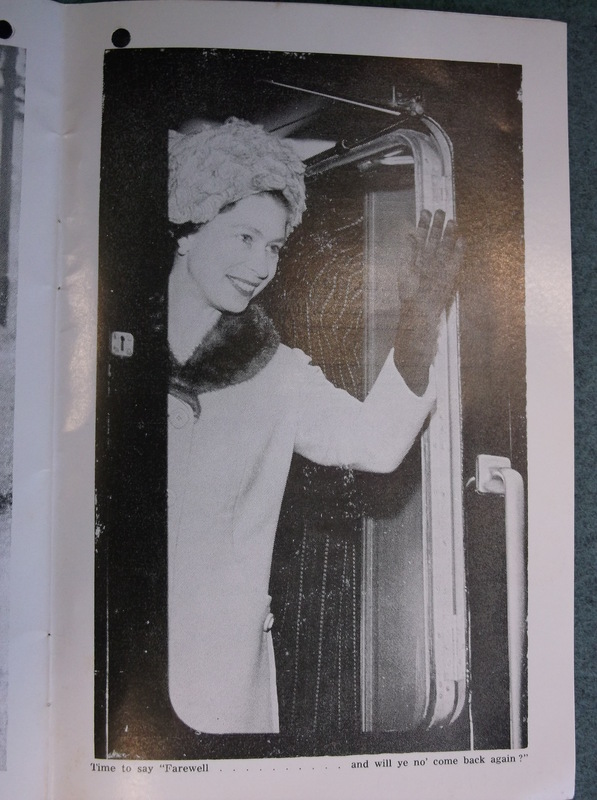 On 10th May 1968 the Queen arrived by train into Matlock and was greeted by a huge crowd. She did a number of things on her visit such as, visiting World War one veterans, travelling over to Lea green centre and Lea Mills. Here at the record office we have a souvenir brochure from that day including a selection of photographs taken by the Matlock Mercury and many captions under the photographs which although not very exciting were certainly ironic as the last caption in the brochure which was under a picture of the Queen waving good bye was “Time to say farewell …. And will ye not come back again?” Well in answer to that question, yes she has and I’m sure Matlock will greet her with as much joy as they did back in 1968. Our names are Harriet and Emily and we completed our Year 10 work experience at the Derbyshire Record Office this summer. We have done so many different things that we never thought we’d have a chance to do and have enjoyed every minute of them!